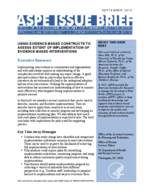 Using Evidence-Based Constructs to Assess Extent of Implementation of Evidence-Based Interventions. What Is the Change Process? Creating includes the research and development activities that provide the knowledge base for developing interventions, programs, and innovations. This phase also includes establishing strategies for making interventions available for use, assessing readiness, and scaling up. Implementing is when individuals, agencies, or communities apply the new intervention, program, technology, or method. Figure 1 illustrates how these three phases unfold. It also illustrates several ideas important to understanding the change process in general and implementation in particular. One especially important idea in figure 1 is the Giant Leap. Sometimes, there is an implicit expectation that accomplishing a change will be simple and quick, that practitioners who are implementing an intervention need only to jump across the gap and start using the new way. This perception does not accurately represent the complexity of how change occurs in organizations, in communities, or with individuals. Also, most interventions require implementing a set of practices and structures simultaneously. A common misunderstanding is the expectation that all practitioners in an organization or large system make the Giant Leap at the same time. Source: Hall & Hord (in press). Figure 1 represents another idea about change: the size of the gap and the distance that must be covered in one leap. Most expectations for implementing new interventions require leaps too long for many to achieve. Change initiatives will be more successful if there is an Implementation Bridge. As a metaphor, the Implementation Bridge can help us examine the activities, challenges, and barriers involved in achieving successful implementation. For example, each practitioner who implements an intervention has to make it across the bridge. As practitioners move across the bridge, they gain knowledge, skills, and confidence in using the new intervention. Individuals and organizations also need ways to measure, monitor, and assess how far across the Implementation Bridge an intervention has progressed. These steps and the information gathered during these steps are important to inform further progress, identify where additional support is needed, gauge the effectiveness of an intervention to produce desired outcomes, and identify unintended consequences. The effort and level of support required during the implementation phase will vary dramatically based on characteristics of the change and the context in which it is introduced. 1 In other related work, we refer to the terms “innovation” versus interventions. In this brief, we define the term “intervention” as: (a) a procedure, or set of procedures (b) designed for use in a specific context (or set of contexts) (c) by a specific set of users (d) to achieve defined outcomes (e) for (a) defined population(s) (c.f. Cook, Tankersley, & Landrum, 2009; Dunst, Trivette, & Cutspec, 2002; Flay et al., 2005; Horner, Sugai & Anderson, 2010). Interventions are what we do to achieve desired outcomes.